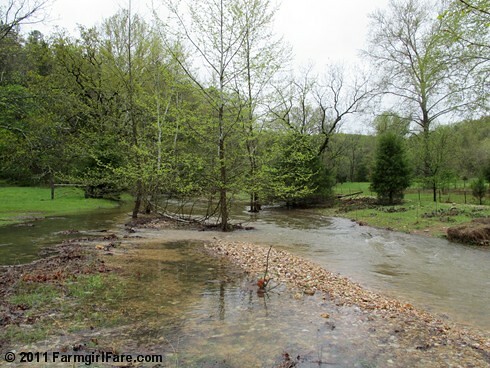 Farmgirl Fare: Monday Farm Photos: Creek's Up. Way Up. After we've had a whole lot of rain—like the six or seven inches that have fallen in the past couple of days—our pleasant little creek begins to overflow. And then things start to flood. That's where we are today—and it's still pouring. The problem is that the creek runs between The Shack and the sheep barn, where there are currently 20 ewes (three of whom are pregnant), one extremely old pet wether, and 30 bouncing baby lambs residing. Our two rams are in a large pen adjacent to the barn. Everybody needs to be fed three times a day. Our splinter flock of 17 non-pregnant, non-nursing sheep has been out free ranging on fresh spring grass for the past week, and they managed to get themselves stuck on this side of the creek, which is fine. There's plenty to eat, and Marta Beast has been staying with them. 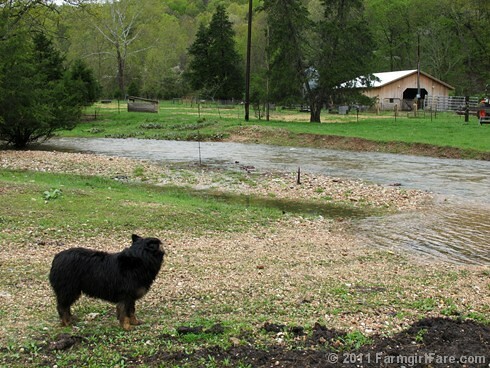 We already can't make it out to Donkeyland, and by yesterday the creek was too high to walk across to the barn. By this morning it was too high to drive across. Joe can still make it over in the four wheel drive tractor (driving backwards so as not to flood the exhaust system), and he spent much of today working over there in the pouring rain, trying to drain the flooded barnyard and ram pen. Thankfully he got enough done just in time to keep the barn from flooding. I took these photos this morning during a few minutes when it wasn't raining, and the creek is already a whole lot wider, deeper, and faster now. As of a few hours ago, Daisy, Marta, and even Bear were still crossing it, though I really wish they wouldn't. Beagle Bert is on lockdown in The Shack, even though Joe says he watched him turn back this morning after trying to cross in four different spots because he knew he couldn't make it. I just don't want to risk him bounding after Daisy or Bear and washing away. 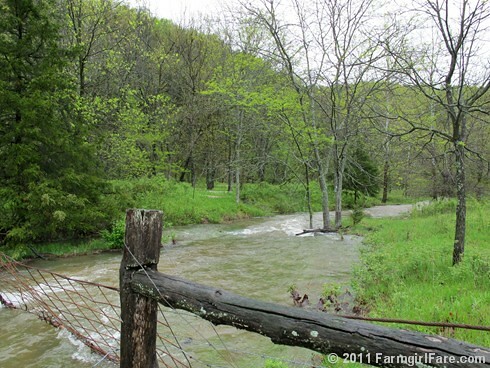 We need rain this time of year to help the grass (which feeds the sheep) grow, but now the fields are starting to flood. Even if it stopped raining right now, which it's not going to, the water would keep rising for about another 12 hours. I've seen the creek much higher than this—and even much higher than this—but hopefully it won't get that bad this time. Monday is usually when we go out to pick up the mail (the post office won't deliver way out here) and our standing weekly milk order from the Jersey cow down the road, as well as pick up supplies, but Joe said if we made it out this morning, by the time we got home (last week we made 15 stops) we might not be able to drive back across, and he was right. Swiftly moving water can be extremely dangerous, and we're taking precautions to keep everybody safe. Since it's doubtful Joe will be able to make it across the creek on the tractor in the morning, we're trying to arrange for somebody to come down and take care of the sheep. In fact, the donkey peddling cowboy, whose father grew up on this farm, called just now to see if we needed him to come over and do the evening barn chores—after he asked if we were building an ark yet. He also said he heard we're supposed to get another 8 inches of rain. I sure hope not. I never complain about the rain because we always need it (and I actually love stormy weather), but the grass can't grow if it's under two feet of water—and after checking on the ewes and lambs every few hours around the clock for the past month, it's sort of driving me crazy that I haven't seen any of them since yesterday. Want to get wetter? You'll find lots more photos of our creek here and here. 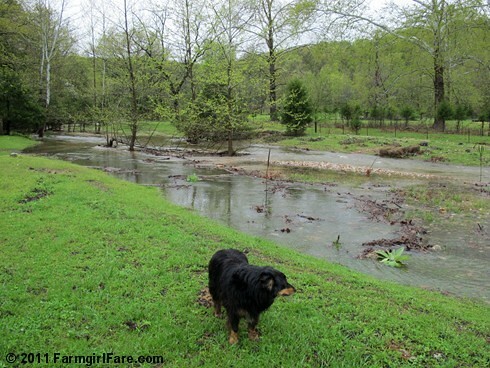 © FarmgirlFare.com, where words like boring and uneventful are not in the farm life vocabulary—and it's raining in my office. I can't wait to move out of The Shack! Living in SW Missouri is challenging at times and this being one of them. We do need the rain for the fields and gardens, BUT enough already. There are places in the United States that haven't seen rain in months. What about use sharing with them? Stay safe! P.S. My garden is doing the backstroke!!! 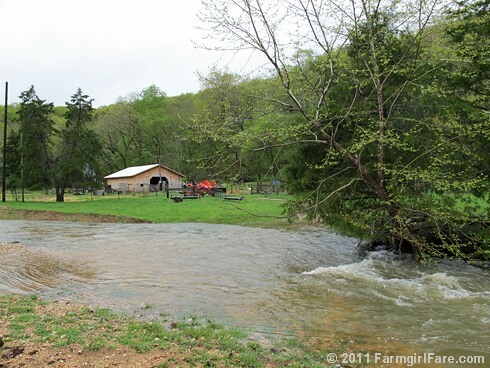 When you move out of the Shack will you be on the same side of the creek as the barn? 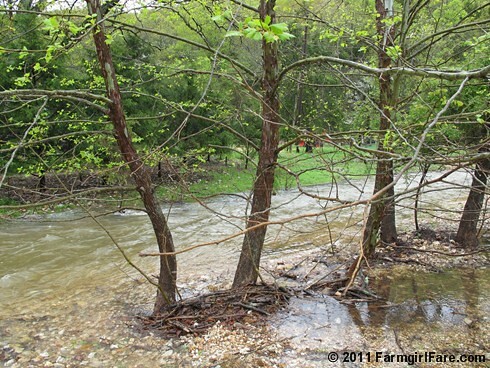 That creek is so very lovely (when it is at a reasonable water level)...let's hope that the rain holds off so that your precious creek can come down to manageable...non-washing things away...levels! Lots of energy in the atmosphere creates weather unlike what we are accustomed to living with. Hope the babies are all doing ok. Thought of you all this morning as I watched the news of the MO flooding. May you all ride out the storm safely. Hope Dan does not decide to try crossing the creek! We have one that does the same thing. We picked a narrow part and made a bridge over it. We use long telephone poles laid down and named treated lumber over the top of the telephone phones. Hope you are doing ok. 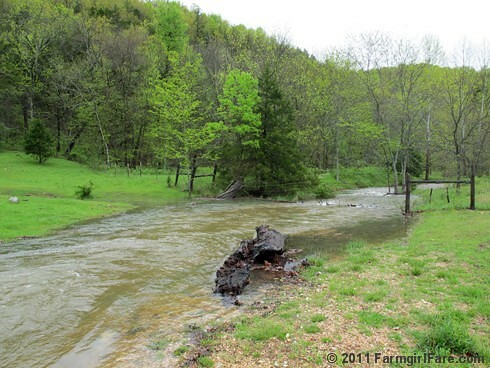 I have been watching the news reports about the flooding in southern MO and thinking about you. Wishing you luck and safety. Stressful. 2011 weather has been over the top already. STL not faring very well either & our little rivers and big ones are all swollen. Hope your mamas fare well! WOW OMG! I live in Mid. TN. and we also have been getting a ton of rain/storms. Keeping you in my thoughts and prays.! We are in south central Texas and haven't had one drop of rain since January 16th. And even then, we only had 1/2". We are in an exceptional drought - tree limbs are just falling off, grass is dead, my pecan and olive trees are slowly giving up the fight. Sigh. It's one extreme to the other.